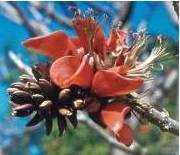 Erythrina lysistemon occurs in a wide range of altitudes and habitats from North West Province, Limpopo (formerly Northern Province), Gauteng, Mpumalanga, through to Swaziland and KwaZulu-Natal, and down to about the Mbashe River Mouth in Eastern Cape. Further north in Zimbabwe, Botswana and Angola it occurs in small pockets. It grows in scrub forest, wooded kloofs, dry woodlands, dry savannah, koppie slopes and coastal dune bush and also in high rainfall areas. There are ± 100 species of Erythrina that occur in the warm regions of the world. Nine species occur in southern Africa: E. acanthocarpa, E. baumii, E. caffra, E. decora, E. humeana, E. latissima, E. lysistemon, E. mendesii and E. zeyheri. Kirstenbosch National Botanical Garden has excellent specimens of Erythrina lysistemon, E. caffra, E. humeana and E. latissima that are very showy when in flower. 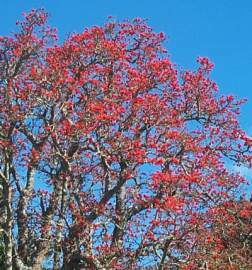 Erythrina lysistemon is often confused with Erythrina caffra, the coast coral tree. 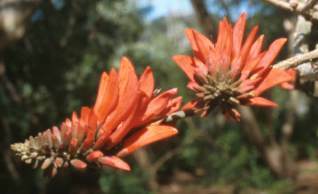 Erythrina caffra grows in the coastal and riverine fringe forests from Port Shepstone in KwaZulu-Natal to the Humansdorp District in Eastern Cape and in a pocket further north on the KwaZulu-Natal coast. It is generally taller than Erythrina lysistemon, the flowers are orange-scarlet, and a cream-flowered form is occasionally seen, and the standard petal is shorter and broader so that the stamens stick out of the flower giving it a whiskered look. In most other respects they are very similar, and were in fact regarded as the same variable species for many years and, when not in flower, are difficult to tell apart. The genus name Erythrina comes from the Greek erythros meaning red, both the flowers and the seeds are bright red. The species name lysistemon also comes from the Greek meaning 'with a loose or free stamen' and refers to the 'vexillary stamen' that is free from the staminal tube. The vexillary stamen is the stamen associated with the vexillum, which is another term for the standard petal, and in this species it is free, whereas in e.g. Erythrina caffra it is joined to the staminal tube below the middle. Erythrina lysistemon is not just a decorative tree, it is also an important component of the ecosystem, providing food and shelter for a variety of birds, animals and insects. Many birds and insects feed on the nectar. Vervet monkeys eat the flower buds. Kudu, klipspringer, black rhino and baboons graze on the leaves. Black rhinos, elephants and baboons eat the bark. Bush pigs eat the roots, and the brown-headed parrot eats and disperses the seed. Birds such as barbets and woodpeckers nest in the trunks of dead trees, and swarms of bees often inhabit hollow trunks. Erythrina lysistemon is also widely used and enjoyed by mankind. They have been regarded as royal trees, and were planted on the graves of Zulu chiefs. They were planted as living fences around kraals, homesteads and waterholes, and were one of the first wild trees to be planted in gardens in South Africa. They are still to be found in many gardens, and are planted as street trees in many towns. The wood is light and cork-like when dry and has been used for making canoes, rafts and floats for fishing nets as well as for troughs and brake-blocks. It has also been used to make shingles for roofing, as the wood is durable when tarred. The flowering of the trees has been, and still is, a good signal to the people that it is time to plant their crops. 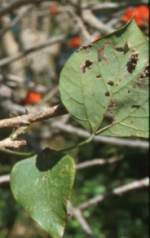 Erythrina lysistemon is thought to have both medicinal and magical properties by many people. 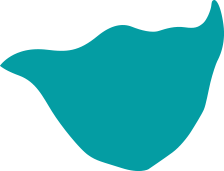 A tribal chief will wash in water in which bark has been soaked as he believes that by doing this he will ensure the respect of his people. Women about to give birth are given an infusion of herbs to make the birth easier and a sliver of bark from the four sides of the tree is tied around the bundle of herbs before it is boiled. Water in which bark has been soaked is mixed with the root of a species of Cussonia and used as a purifying emetic. Crushed leaves placed on a maggot-infested wound are said to clear the maggots. The bark applied as a poultice is used to treat sores, wounds, abscesses and arthritis. Infusions of the leaves are used as ear drops to relieve earache, and decoctions of the roots are applied to sprains. Erythrina lysistemon does contain a large number of alkaloids that are known to be highly toxic, but its use in traditional medicine suggests that they have antibacterial, anti-inflammatory and analgesic effects. The seeds are used as lucky charms. According to Braam van Wyk and Piet van Wyk, who are indigenous tree specialists, the seeds also contain toxic alkaloids as well as anti-blood-clotting substances that may be of value in the treatment of thromboses. Erythrina lysistemon is a fast-growing, undemanding tree. 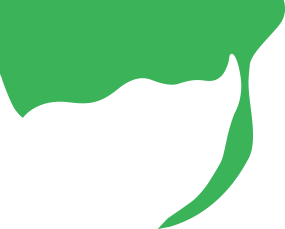 It does best in fertile, well-aerated and well-drained soils. It is fairly drought-tolerant, but performs better if given water during summer. It is sensitive to cold and grows best in frost free gardens, but will survive in regions with a winter minimum of -7 to -1 °C/20 to 30°F (zone 9) provided it is planted in a sheltered position, and protected from frost when young. This tree prefers dry winters, but it will thrive in the wet winters of Western Cape as long as it is planted in well-drained soil and watered during the dry summers. Coral trees are attacked by a boring insect that enters at the tip of a branch and causes die-back. As soon as this is noticed, the damaged branch should be cut back to unbored wood and the prunings should be burnt. It is difficult to control on big trees, but it can be done with a systemic insecticide. Caterpillars can cause damage to the foliage, and an insect causes yellowish galls on the leaves, but these do not seem to affect the overall health or performance of the tree. The common coral tree is an excellent specimen tree for gardens and parks and is very effective planted in avenues or for street plantings. It is particularly recommended for that spot in the garden where you need sun in winter and shade in summer. Erythrina lysistemon is easily propagated from seed, cuttings and truncheons. Seed is sown in spring and summer, in a well-drained, general-purpose potting soil, placed in a warm but shaded spot and kept moist. Soaking the seed overnight in warm (not hot) water is not necessary for germination to occur, but should hurry things along. Dusting the seed prior to sowing, or drenching after sowing, with a fungicide that combats pre-emergence damping off, although not essential, will increase the percentage germination. Cuttings are best taken in spring to summer, and truncheons in late winter to spring. Truncheons are made from part of or even an entire branch which is left to dry and heal for a few days, then planted into a pot filled with sand or even directly into the soil where the plant is to be grown, and kept damp but not wet. If a plant has to be transplanted, this is best done whilst it is dormant, during winter. PALGRAVE, K.C. 1977. 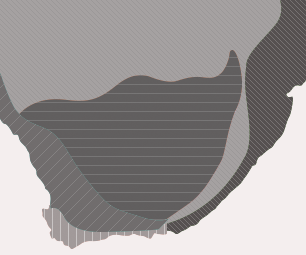 Trees of southern Africa, edn 2. Struik Publishers, Cape Town, Johannesburg. POOLEY, E. 1993. Trees of Natal, Zululand and Transkei. Natal Flora Publication Trust, Durban. SMITH, C.A. 1966. Common names of South African plants. Memoirs of the Botanical Survey of South Africa No 35. Department of Agricultural Technical Services, Pretoria. VAN WYK, P. & VAN WYK, B. 1997. Field guide to the trees of southern Africa. Struik Publishers, Cape Town.